Adults take 2 capsules twice daily. Best taken with meals. Do not exceed recommended dose. This product is not intended for use by children under 18 years of age. Do not use if pregnant, nursing, or if you have ulcers, or kidney disease. If taking any medications, consult a healthcare professional before use. How does pH affect calcium absorption? Calcium absorption is optimal with normal mealtime stomach acidity. The acid of the stomach helps break up calcium so it can be absorbed in the intestines. Those without optimal stomach acidity, such as older people, may not absorb calcium as well as others. 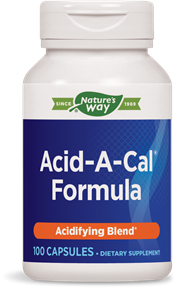 Why is there kidney extract in Acid-A-Cal®?